I hadn't really given much thought into the detail that goes on in making hair scrunchies..... until now! 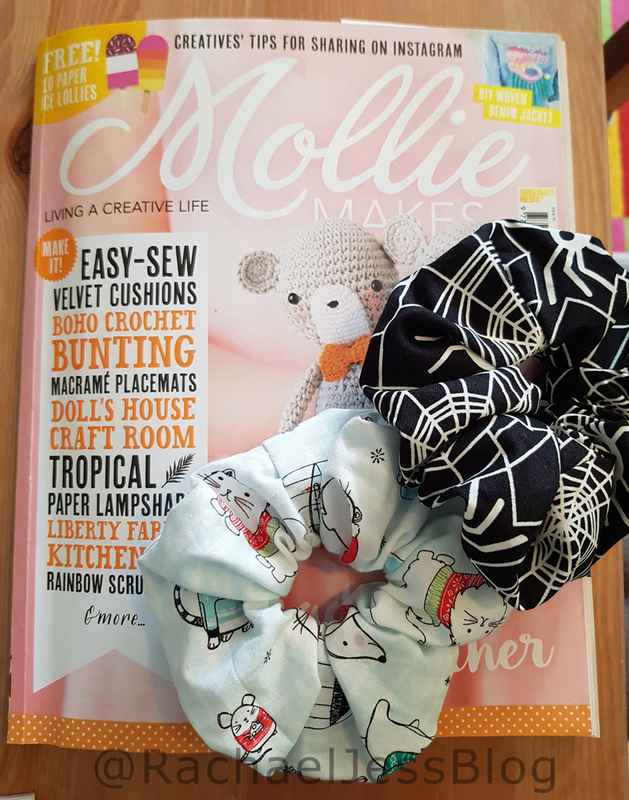 Flicking through Mollie Makes I saw a lovely tutorial by Gillian Martin on how to make scrunchies. As there weren't many steps I decided to give it a try, after all, I'm no stranger to elastic after making my TARDIS dress! With Halloween and Christmas approaching I thought I'd use fabrics to reflect this. On hindsight my Christmas fabric was the completely wrong design, as once 'scrunched up' you couldn't see what the pattern was. The process is very straightforward. Once you've selected your fabric (by scrunching it up if it's patterned) it is simply a case of cutting it into strips. As per the instructions, all mine were 56cm long. The fun part.... was the braided elastic. Having had to make 3 elasticated skirts for my TARDIS dress, I am no stranger to threading this slippery little sucker through a tube anymore! You need your safety pin, patience, and a little bit more patience. 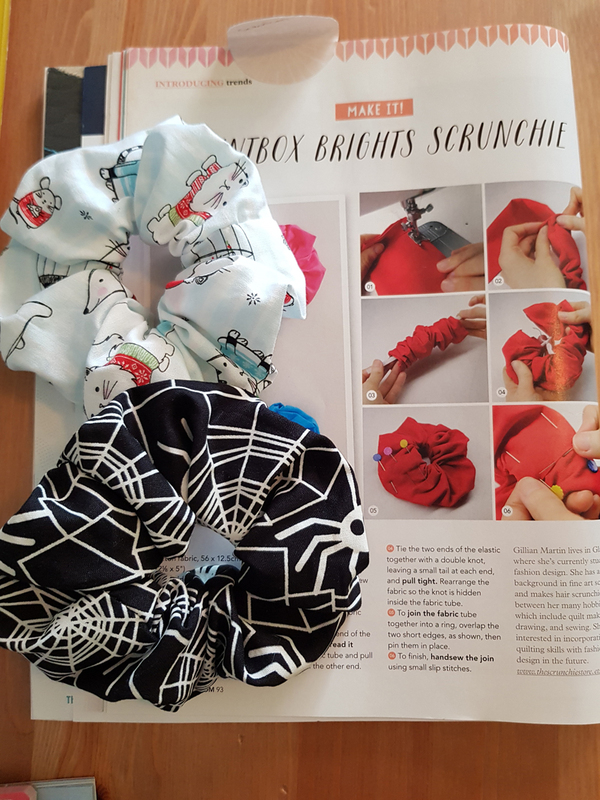 And finally, had I read the instructions before starting this, there may not have been any scrunchies made! To complete this project there is an element of hand sewing. THIS I am appalling at! Of course, there is hand sewing! How did I think the fabric joined together! 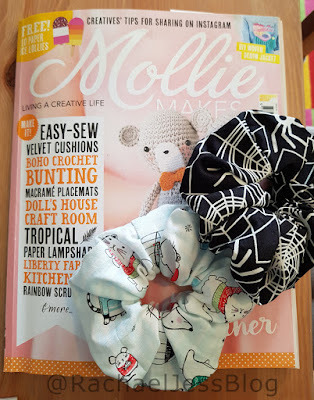 After refreshing my memory as to what a slip stitch was, I set about joining the scrunchie together and you know what, after the 10th one, I'm no longer put off by a slip stitch. In fact, I'd go as far as to say I got rather good at it! That was my weekend project and as with everything I make, I can see the faults by the time I've finished, and then self-sabotage sets in and I don't think they are very good products! So for the first time ever, I put a shout out on Facebook to see if anyone was interested in them and I was amazed at the response! 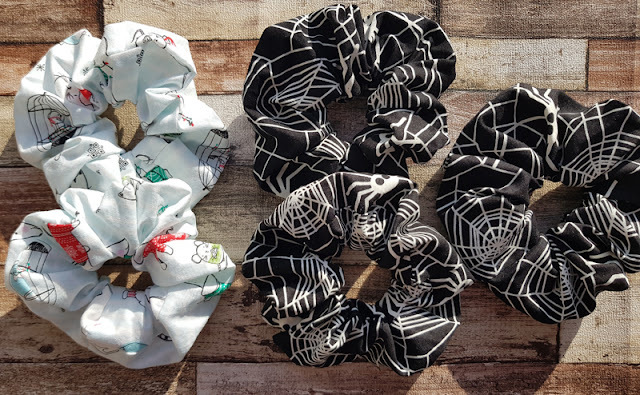 Everyone LOVED the Halloween scrunchies, and would even pay to have them!! * I need to have more confidence in my abilities! I know I've written that twice, it's because it's important to remember! I'm going to try and make some more Halloween ones before the end of the month, and then source some nice patterns that work as scrunchies for Christmas. Does anyone else have issues with confidence in their projects?